And tea. Not last thing, because then the witch’s brain really does whirl. I like this pile of books with the cup on top. I have a cup just like it. Six, in actual fact. It’s a 1960s collectible and I keep it safe(ish) somewhere far away. So the tea will have to appear in something else. And my books aren’t quite as prettily pastel coloured, but their contents will be just lovely. 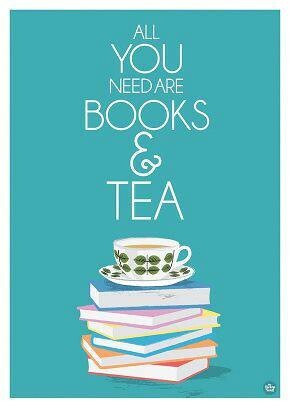 I’ve had a couple of intense days, and I could really do with some books and tea and nothing. In his review last week of Camilla Läckberg’s The Lost Boy, the Resident IT Consultant mentioned the standard clichés you tend to encounter in Nordic crime fiction. OK, neither abuse nor suicides are terribly enjoyable, albeit facts of life and probably quite appropriate in crime novels that tend to deal with death and violence. But I claim the right to have my motorcycle gangs, and my archipelagos! They are a way of life. They are also common enough not to merit cliché-dom, simply because you expect them. Motorcycle gangs are rarely young killers in real life, though. They are middleaged and orderly, living their dream. What’s not to like about wearing black leather and driving around the beautiful Nordic countryside? Stopping for coffee and waffles at some scenic outdoor café, and life is just perfect. 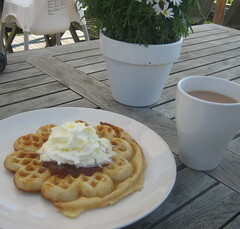 But the crime novelist might be better off not mentioning the waffles. As for the archipelago; we ‘all’ have one. Strictly speaking, it needn’t be an archipelago. A beach will do. Somewhere by the sea. Or the side of a lake. If the water is missing, there will be forests. And in that forest or by that stretch of water – on or off an island – is a cottage. You don’t have to be rich. Not on the breadline either, obviously, but you can be – and most likely are – completely ordinary. 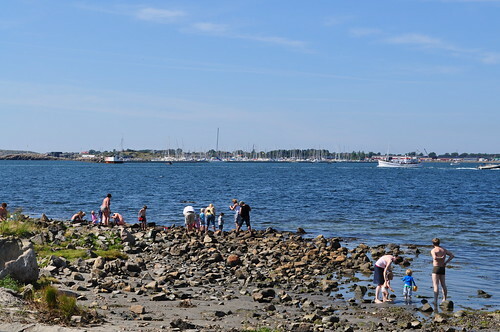 I have had an ‘archipelago’ all my life, in the shape of a beach on the Swedish coast. The landscape looks like Kenneth Branagh’s Ystad. 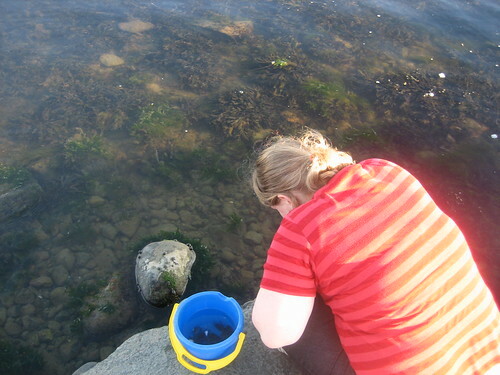 My first trip I was one week old, and we spent the next eleven summers in the same cottage. It belonged to Favourite Aunt, and the cottage next to hers was Aunt Motta’s, and all the cousins crowded in and slept packed like sardines. Beach and sardines. Privy. It couldn’t have been more wonderful if it tried. And it goes without saying that had we been the murderous type, we’d have done the dirty deed in this idyllic and sunny setting. That’s why you set your crime novel in an archipelago. Not because everyone else does. We still holiday there and whenever we go for waffles, the motorcycle gang is sure to follow. You already know I get a lot of books. So does the postman, because he carries them here, and he needs to ring the doorbell to hand over all those packets too fat for the letterbox. One day recently, I was upstairs, working. I heard the postman arrive, but he didn’t ring, so I remained where I was. Silly me. There was some thumping, but I imagined things were under control. Silly me. I forgot all about it, until lunch or some other mundane reason propelled me downstairs. I looked at the hall floor, where the postal offerings were spread out. Something didn’t look quite right. 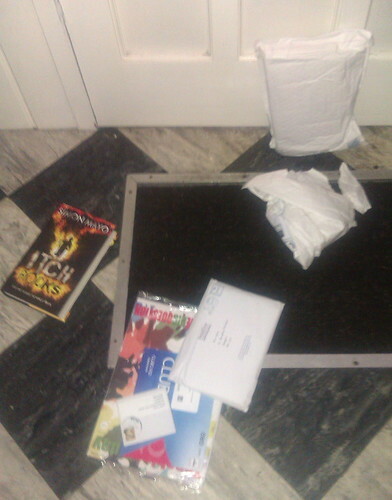 So, the postman unpacked my post for me. All that remained was to bin the jiffy bag and to put the book somewhere safe. It was a Thursday, so not one of my usual postmen. That’s probably why he assumed I was out (with no car on the drive, how could there possibly be a human inside the house?) and didn’t try knocking or ringing. 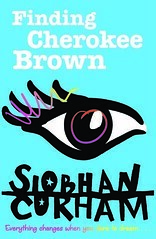 Had barely got going with reading Finding Cherokee Brown before I desperately wanted a new haircut. A really cool one. And reinventing myself seemed like a good idea. But, I don’t have long enough hair to start getting inventive, nor is there terribly good raw material for a new witch. It’s her birthday, and apart from some school mates who promise to kill her, Claire makes unexpected contact with her long lost real father. And that’s where the changes start happening. Claire finds her real self, and slowly works towards dealing with her issues at school; both with other pupils and with staff. Her ‘new’ Dad is quite exciting. He seems to care about her (but her Mum keeps going on about how he just walked out on them when Claire was a baby) and he wants to do things for her, and with her. This is a fun book, and it deals well with bullying and family issues, and I really enjoyed it. And if it can leave someone like me hankering for new hair, I hope it will entertain and help young readers. When is one o’clock not one? Or twelve, or two? I failed on a technicality yesterday. The sandwich was ready, the orange was peeled and the tea just right. So was I. Ready, more than right or peeled. I was going to sit down to watch the announcement of who would be five million kronor better off. Yes, it was ALMA time. The Astrid Lindgren Memorial Award was about to be awarded. It was 11.52. It was 11.52 both in the UK and CET. That’s not possible. I checked. It’s before summer time, so it wasn’t that either. But my noon announcement was not about to happen until one. Or so the countdown thingy suggested. At 12.01 facebook (yes, fb again) pinged, and one of my savvy fb friends announced the award had gone to Isol. I refreshed all pages that could be refreshed. It said 58 minutes to go. I did what any sensible bookwitch would do. I picked up my early lunch and went to read a book instead. At one I tried to see if the system would be more amenable. It wasn’t. It was error messages all round. The ALMA press office had emailed the glad tidings at 12.11, so I knew I could expect no more. 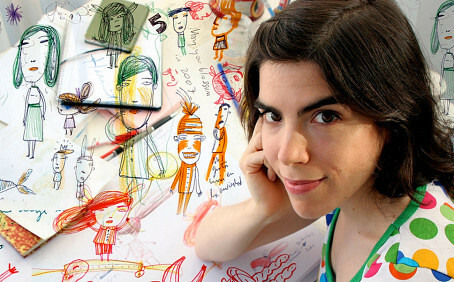 Isol is an Argentinian illustrator, cartoonist, graphic artist, writer, singer and composer. From what I could see in the press release there were only Spanish titles, and whereas I have actually heard of her, it was yet another Nobel style choice of someone many people won’t know at all. I imagine the Spanish speaking world – which is large – do know her work. I wish Isol all the best, but I can’t help feeling that my first thought when I saw ISOL in capitals on fb was that it was an organisation getting the money this year. I believe organisations can do more with these kind of sums. I sometimes wonder if the jury are aware quite how much money they are handing out. I mean really, really. When someone on facebook got disgruntled about his most recent trip to the post office a few weeks ago, I had no idea I would be agreeing with him quite so soon. I mean, I was already gruntling along, and have been for years. But this is getting silly. I have been concerned that I am single-handedly closing down post office branches. But I can’t be that powerful, can I? Besides, I wouldn’t want to. The fb friend had been the target of the over-selling they engage in these days, even in the tiniest sub post office. I forget what, but have an inkling he wanted stamps and they wanted to sell him insurance. 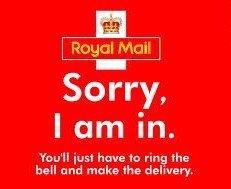 I generally pop in (although it has to be admitted, with increasingly longer gaps between visits) for stamps, other letter services or cash. So I don’t need to be asked if I require a top-up or if they can do anything else for me today? It makes me so uncomfortable I try and work out ways to avoid going in at all. What I miss is the staff who would tell their colleague that ‘Mrs Bookwitch likes her cash in tens.’ Staff who sold me the stamps I wanted, and if I had forgotten to order them they would get them in anyway, because they knew roughly what I’d be wanting. Anyway, on the day when fb friend wanted no insurance, I went in to buy the new Jane Austen stamps. I’d not double checked the issue date, but fb had been awash with comments on the postal Miss Austen, so I felt I was about right. 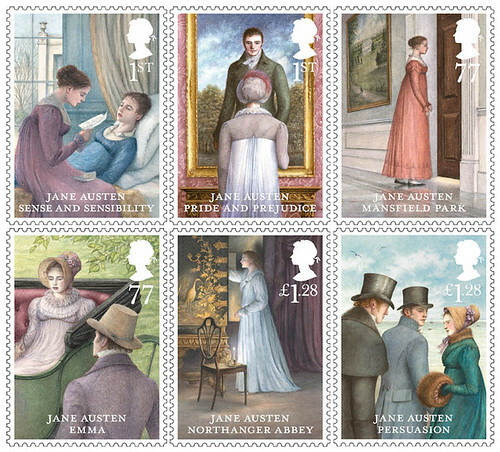 She went behind the scenes to speak to the boss, returning to say that they are such an insignificant post office they don’t get the Jane Austen stamps. 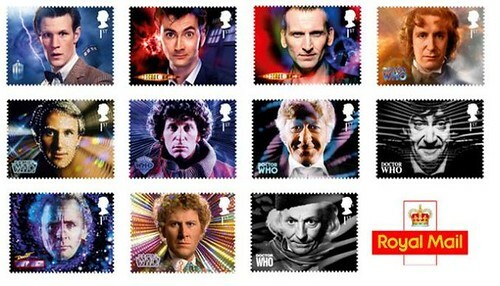 ‘And we can’t even sell the Doctor Who stamps yet,’ she finished. I thanked her (for what?) and left, with no sale made. Not even a little top-up. Once home I looked up the dates. Jane Austen was the day before my visit. Doctor Who is today. So it would have been very surprising to get them five weeks early. This is precisely why I don’t want to go there. I can’t get what I want, and I can’t want what they can let me have. The last literary stamp debacle was a couple of years ago when I rashly decided I’d like the fantasy book ones, featuring Nanny Ogden and Dumbledore and all the rest. So I ordered them from stamp headquarters in Edinburgh. The professionals. OK, so it cost a bit extra to have them sent, but I saw this as saving on the bus fare to the main post office. These professionals sent me only some of what I ordered. I emailed to demand the rest I’d paid for. The automated reply suggested I should expect to wait five weeks for a reply. I emailed back telling them to get their skates on. They apologised and sent me some stamps. Not all of them, obviously. I wrote back. Had another offer of a five week wait. I mentioned the skates again. They sent some more. Not all of them, obviously. And so we went on, until my order had been fulfilled. The lovely thing about stamp headquarters is that they sell to philatelists, so wrap every stamp very nicely and well. That’ll be why they charge extra. This way, I had beautifully presented – albeit in short measure – stamps every time they posted some more out. That must have cost them a lot, in the end. It was with this in mind that I really didn’t want to bring Jane Austen up at the local PO. Nor did I want to renew my email correspondence with those incompetent professionals up north. One solution is to send no post. I suspect that far too many of us already do this (don’t do this? ), and that’s why they are going under. My old postal heart is bleeding, but what can I do? It’s gross. There is no other word for it. Well, nightmarish, perhaps. The kind of stuff you see at night and hope will be gone when you wake up. And I wonder if Paul Magrs could possibly have imagined how we’d be talking about our food in 2013, when he came up with the idea for The Ninnies, or even when his book was published last year? I’ll give you one clue. It’s not horse. But you will go off your food. When I began reading this (as an ebook) I had no idea where it was set. I only realised it was close to home, reading about the ‘crisps’ and the crisp factory as my train sped past the very place. It mainly happens in ‘the Stockport Road’ and this is not a good reflection on that town. So, you witness some outlandish creatures grabbing your dad and driving off with him. Your pregnant mum thinks the two of you have been abandoned. You have weird neighbours and you meet an unusual girl who introduces you to some very moreish crisps. People are going missing all over the place. Those neighbours know something. Your new friend is happy for an adventure looking into these disappearances. And what’s going on at the zoo? It’s yuck everywhere, but this will probably appeal to non-crisp-eating boys, and maybe girls. Described as a YA fantasy, it is quite realistic. Really. Apart from the fantastical elements, which are no longer as far-fetched as they were. If you think I’m skirting around the whole issue, you are correct. There is only so much I can subject you to.